Following the critical success of their contribution to Robert Moran's second innova CD, Mantra, Dan Moore and Iowa Percussion took on this ambitious new recording, Cabinet of Curiosities. About Mantra, Sequenza 21 declared: "The three percussion ensemble pieces exude happy and peaceful energies. Of particular note is the work 'Stirling: It's Raining Cats and Dogs.' This piece, for a gargantuan setup of percussion, does for the rain what Messiaen did for bird calls." "Iowa Percussion does an absolutely phenomenal job with their three pieces. I hope we hear more from this ensemble in the future." They got their wish with Cabinet of Curiosities: The Graphic Percussion Scores of Robert Moran. This historically important compendium of Moran's graphic percussion scores from 1962 to 2010, plumbs the depths of this highly creative form of composition — from purely atmospheric sound explorations to studies of rhythm, melody, harmony, and musical interaction. The scores are visual artworks in themselves but come to life in performance where the players use their creative imaginations to interpret the non-standard shapes, signs and instructions. Created with the audiophile listener in mind, the recording is intimate and transparent, taking the listener on a very personal "elegant journey" through the beautiful and intoxicating world of graphic composition. The longest work on the disc is Salagrama, for percussion and organ, created for Graz cathedral employing pitches tuned to Kepler's Harmony of the Spheres. Percussionist Dan Moore's expertise ranges from new music to fringe jazz, folk music of the world, and many points in between. Musician, composer, and educator, he travels the world performing his own distinctive brand of music that explores the expressive capabilities of percussion. In 2006, it was pure serendipity when through an unexpected collaboration with choreographer Armando Duarte, the love affair amongst Robert Moran, Dan Moore, and Iowa Percussion began. But Moore had become a Moran aficionado long before their first meeting: "I performed some of his pieces while still a student. I have great admiration for the creativity, beauty, rhythm, and humor of his music." Moran, arriving for the first time in Iowa City for that collaboration, found a "dazzling" array of percussion instruments at his disposal, and performers willing to throw themselves headlong into his music. He quickly became an admirer of Iowa Percussion: "I went to Iowa City for this percussion premiere and heard one of the finest performances of any of my scores in my entire career. It was my great fortune to write for this splendid ensemble." Philly-based Robert Moran studied with Apostel, Berio, and Milhaud long ago but never aligned himself with any musical "-isms." His works range from Fluxus type community events to post-Minimal textures, and "shamefully Romantic" languages. Dopo la felice prova dello Iowa Percussion Ensemble alle prese con un recente, fantasioso e irresistibile brano di Robert Moran in una precedente uscita discografica, il matrimonio tra i musicisti e il compositore ci viene riproposto in questo nuovo cd Innova. Ben diverso è però il carattere dei brani qui eseguiti. Si tratta infatti di composizioni scritte da Moran intorno agli anni ‘60 (alcune rielaborate negli ultimi anni) utilizzando partiture grafiche (di per sé, quasi delle opere d’arte visuali) che poco hanno da spartire con la produzione post-minimalista tipica dell’ultimo Moran e contrassegnata da melodiosità estesa, ritmica vivace, vena espressiva e una buona dose di humour. Le musiche qui eseguite si avvicinano molto a quelle del Cage post-1950, nella sua fase aleatoria e influenzata dal pensiero Zen: esse possiedono infatti un’indubbia qualità ambientale, e rinunciano consapevolmente alla dimensione narrativa ed espressiva. I labirinti sonori costruiti da Moran ed eseguiti con passione dallo Iowa Percussion Ensemble, pur non essendo il vertice della produzione dell’autore americano, rappresentano comunque una bella testimonianza della sua sfaccettata personalità creativa. "This is the sort of thing that can elicit enormous self-indulgence, and end up sounding homogeneous from one piece to another. Let me testify right now that this is not the case here. In fact, this is one of the finest releases I’ve ever heard to take the indeterminacy bull by the horns and make refined, engaging, and varied music from it. "What makes these performances so successful is: the constant variety and careful choice of seductive sounds (including sampled sounds, in Elegant Journey), the scrupulous attention to different rates of flow (most notable in Meister Eckhard and the Point of No Return and Electric Boogies, which are each the same piece, though the latter—and original version—is five times faster than the former), and just darn great playing all around. And there’s one truly magical work. Salagrama was composed in 1979 for the cathedral organ of Graz. Its original form was what the composer calls an “endless bass line,” tonal but nondirectional. Moore has converted the organ part into a synth sound played by MIDI percussion controller; this provides the shifting pedal, and then he adds a series of tinkling bell sounds around it. The result is truly seductive and hypnotic. At 25 minutes, it’s not a whit too long, and frankly, it’s one of the most beautiful “non-teleological” (non-goal-directed) pieces I’ve ever heard. So bravo to all concerned. This is a tribute to the virtues of open form and notation, when directed to sensitive performers, who bring the whole of their skill and artistry to it." 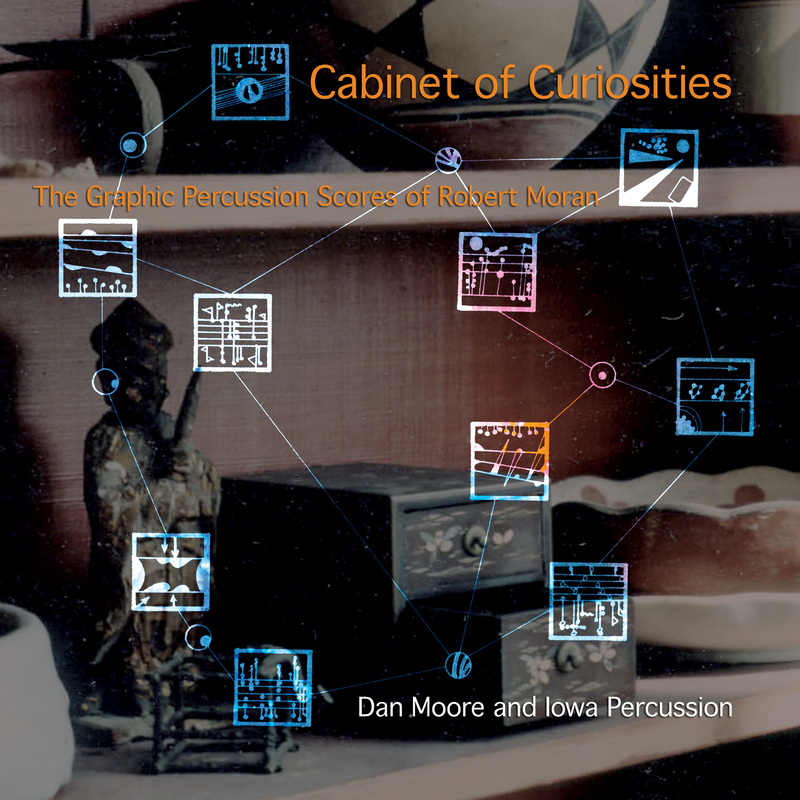 "Cabinet of Curiosities is a curious collection of seven compositions in which Dan Moore and Iowa Percussion realize the graphic percussion scores of Robert Moran. "The centerpiece of the album is a 25-minute sprawler called “Salagrama” (1979), an exercise in gorgeous understatement which was originally commissioned for a cathedral organ, then adapted for percussion. Indeed, in this solo piece overdubbed by Dan, tectonically slow, droning synth notes coupled with barely-there vibes, bells, wind chimes, gongs and a triangle launch a perfect night of midnight meditation." "Atmospheric, sound conscious employing both extended techniques and everyday objects as well as formal instruments, these pieces explore experiential modes of reception rather than formal or structural ones, depending therefore heavily on the performers who, in this case, are exemplary - especially the solo constructions of Dan Moore, clearly a gifted improviser. Salagrama is particularly impressive - apparently consisting of almost nothing, it is so perfectly pitched that it achieves a kind of timeless immersivity that's hard to dissect or quantify."